Has it been a month already? Where has the time gone? Since we last were together, we crowned a new United States Champion, found out what the word “abscond” really meant, discovered the true meaning of “house of horrors” and I’m terrible if you ever invite me to an escape room. Okay, you probably didn’t learn that last one but trust me, it’s true. A big show was promised to us tonight. Will we see another important WWE match photo in this article like last week? Hell yes! Will I crown my first ever 5 Iced Coffee segment? There’s a distinct possibility! Will I shut up and finally get on with the show? Okay, fine! After the open, Shane-O-Mac heads to the ring to a massive pop. Fresno loves the Commissioner, that cannot be denied. He introduces our NEW U.S. Champion, Y2J, Chris Jericho. The place is deafening as thousands of Jericholics stand as one for their hero. One guy in particular held up a sign that read “Y2J #GOAT.” Now what Jericho has to do with Tom Brady, I’ll never know but I did think the sign was creative and Jericho took a minute to stand just to the left of it as the camera focused on him in the aisle way. 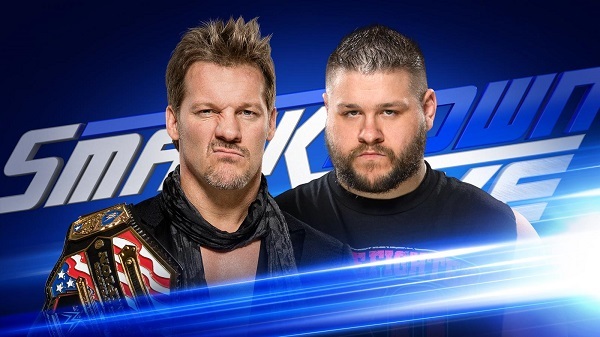 Jericho jokes the SmackDown Live is the “New Show of Jericho, Smack it down man!” This leads to Shane putting his newest addition to work on day one and says that Chris must defend his title tonight against his former best friend, Kevin Owens. This brings A.J. Styles out from the Gorilla position. AJ reacquaints himself to his old rival and even references the Y2AJ shirts that were on the market for about four days last year. Styles says he’ll take Jericho’s belt away at Backlash… if he’s still champion of course! Jericho reminds “The Phenomenal One” that he made Owens tap out not two nights earlier and that people who don’t believe in Jericho will find themselves on The List. Of course, we didn’t get that far as who would come out next but the former United States Champion, Kevin Owens. With his left hand wrapped in tape, Owens snears at his two biggest enemies and calls them both pathetic. He tells Jericho that what he went through at the Festival of Friendship and WrestleMania will be nothing compared to what he’ll experience tonight in the main event. He then turned his fury towards AJ who responded with fists to Owens’s face on the ramp. Officials broke everyone up and it was later announced that AJ would be barred from ringside for tonight’s U.S. Title match. There will be a clear winner. MCGINN’S GRADE: 4/5 ICED COFFEES Solid work by all parties involved. My gut tells me that Jericho’s reign will be quite brief this time but with SmackDown’s unpredictability lately, who the hell really knows? 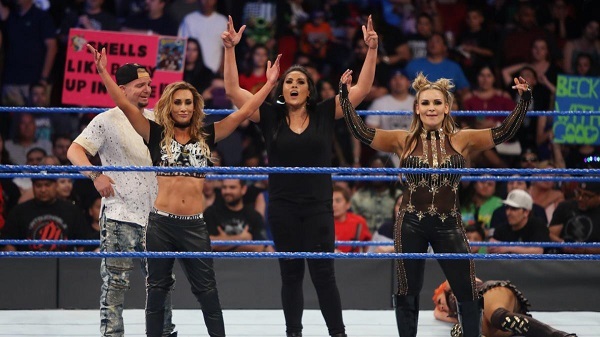 Naomi will team with Charlotte Flair this week to take on Committee members, Natalya and Carmella. This story is getting interesting. I laugh at the idiot who wrote how stupid this angle was three weeks ago! That guy will never write for this site ever again! Back in the ring, Aiden English asks for the spotlight again. On a side note, has anyone ever seen Aiden English and Marvel’s Ben Morse in the same room at the same time? A long time fan of the site with the Twitter handle @Criticalbill77 once asked if he was “the only one who hears a lot of similarities in the voices of English and Morse?” Bill, not only do they sound alike, I think they could be the same person! Seriously though, Ben is a great guy and I’m not just saying that because I want free stuff (But, my wedding is just around the corner, just saying)! Clips of last week’s Women’s Championship match are followed by a backstage interview with Charlotte. She says that the Welcoming Committee can’t change the fact that she is now on SD Live and that Naomi’s belt is her destiny even though they are teammates tonight. Like a plague of locusts, however, Flair is caught surrounded by the entire heel faction and is assaulted three against one. After taking a hard bump into a storage container, Flair is left holding her ribs just moments before our big tag match. But wait, there’s more! The ref called for medical assistance to help Jericho who was clearly shaken after the DDT on the floor. Owens looks dejected and sets down his title belt on the apron. He re-enters the ring to check on Jericho but instead of helping his buddy out, he drops him with another pop-up powerbomb. He lifts Y2J’s lifeless body up and screams “You were never my best friend” and tries to powerbomb him again but Jericho’s body just gave out on him. Owen’s leaves allowing the medical staff to help Chris out of the ring. As he’s walking up the aisle, Owen’s does his Braun Strowman “I’M NOT FINISHED WITH YOU” impersonation and attacks once more. He finishes off Y2J by placing a chair around his neck and ramming him into the steel ring post. Nobody is getting up from that! Owens was right. This was much worse than the Festival of Friendship and WrestleMania. Enjoy the tour Jericho! And there you have it! Crazy crowd, insane finish, and a red hot show as we make our last moves before Backlash. We didn’t even have the WWE Champ on tonight and this show had very little dead space. Honestly, I have the best gig on this whole site and soon I’ll be able to add Nakamura, Rusev and The New Day to this already loaded show. John Cena may not need to come back when all is said and done. Plus, now we have a clear path to an AJ/Owens program with Jericho seemingly out of the picture. FINAL GRADE: 4.75/5 ICED COFFEES Bottoms Up!